VON ORMY—The Society of St. Vincent de Paul serves Von Ormy by operating a local food bank in conjunction with the San Antonio Food Bank. The Society distributes food and clothing to approximately ninety area families each month. This past December alone, 186 coats were given to area residents. The organization’s directors, based out of Sacred Heart Church are Toni Bazaldua and Maria Rodriguez. They along with many dedicated volunteers quietly make this essential service available to those that are in need. 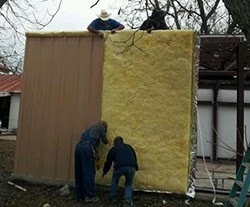 The Society was in great need of a new building to store what they distribute and a handful of volunteers came to the rescue: Gabriel Terrazas, Deacon Carlos Rodriguez, Homero Bazaldua, and Ram Garcia. They recently erected a new building with a cement slab and many shelves.